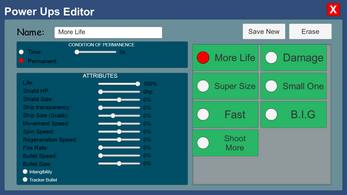 In this editor you will create a list of power ups, which lather you can import into whatever unity project you want. Here you can edit a lot of attributes, that in the end will be saved in a list for you. The Editor is in Portuguese, but we put here a Screenshot with the translation. But if you prefer the translation will be down here to.